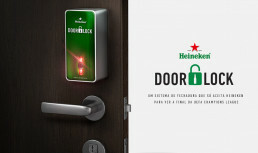 To ensure that no one forgets to bring a pack of Heineken to watch UEFA Champions League at home parties, Wieden+Kennedy (W+K) gave Bolha a special mission: to create the first door lock that opens only with Heineken beer! Heineken Door Lock is a lock with exclusive design, 3D made and printed by Bolha, and an optical barcode reader with a Lilypad, where all the programming of the lock was placed. Five Heineken Door Locks were developed and installed in the home of five lucky winners. Bolha also developed the website, which supported the whole campaign, with responsive design and a game that selected the winners.